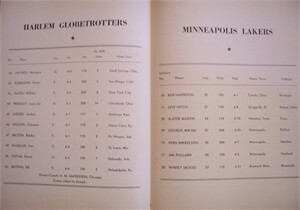 Original four page roster program insert from the November 9, 1951 basketball doubleheader featuring the Harlem Globetrotters vs. the Toledo Mercurys (on the other side) and the main event, the NBA Philadelphia Warriors (on the other side; stars include Paul Arizin and Neal Johnston) vs. the visiting Minneapolis Lakers and the legendary George Mikan. 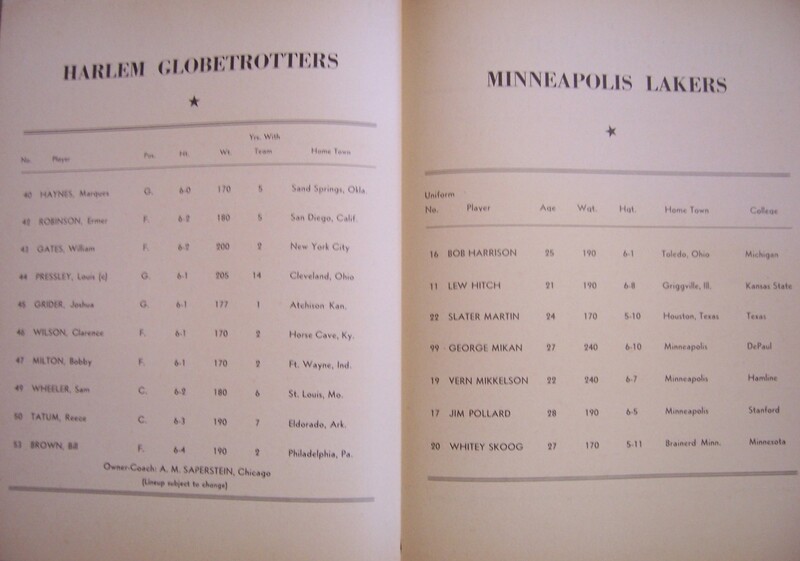 Because the Globetrotters were in town, this insert was included with the Globetrotters souvenir program. Although the Lakers lost this game 98-86, they would go on to post a 40-26 record and win the NBA Finals over the New York Knicks. Excellent condition for its age, just yellowed with minor wear and flaws on the top edge, no writing, stains or creases. ONLY ONE AVAILABLE FOR SALE.